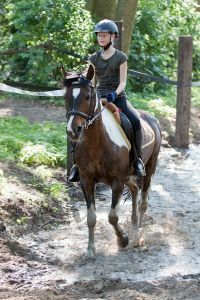 Private lessons are ideal for riders who would like to work intensively with an instructor at achieving individual goals, e.g. mastering one or more exercises, building up confidence in themselves and the horse or improving dressage or jumping skills. Private lessons can be arranged by appointment and can be scheduled almost every day of the week. It is also possible to take weekly private lessons. For more information, please contact us.